It may depend on your genes as to which answer is right for you. Individualized diet advice instead of generalities that apply to the majority! There have been several studies that investigated the effects of a high saturated fat diet on cardiovascular disease stratified by genetic variants. The angiotensin-converting enzyme (ACE) plays a role in maintaining blood pressure at a normal level. It works within the body’s blood pressure regulation system, converting angiotensin I into angiotensin II. Like most of our body’s systems, the right amount of angiotensin II is key: too much will cause blood vessels to constrict and a subsequent increase in blood pressure. 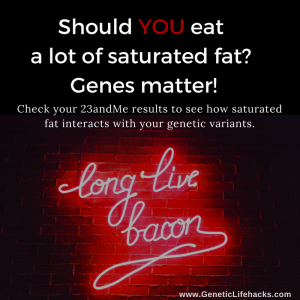 A recent study looked at the interaction between a common variant of the ACE gene, known as the ACE deletion, and saturated fat. It found that for those with the ACE deletion, a diet higher in saturated fat was significantly associated with increased blood pressure and heart disease. In those who were not homozygous for the deletion variant, saturated fat consumption had no effect on the risk of heart disease. About 20% of Caucasians are homozygous for the variant (a little more or a little less for other population groups). G/G: ACE deletion/deletion — high saturated fat diet may increase blood pressure and risk of heart disease. [ref] long-term high fat diet may also impair glucose tolerance. The protein produced by APOA2 is a type of high-density lipoprotein (HDL). Genetic variants can result in either APOA2 deficiency or hypercholesteremia. The most commonly studied variant, rs5082, decreases the level of APOA2. It has been linked to increased BMI, visceral fat, HDL levels and a lower risk of heart disease. The studies that looked at the interaction of this variant with different diets found an increased risk for obesity only in those who had a higher saturated fat intake ( >22g of saturated fat). The variant is also linked to ghrelin (hunger hormone) levels, so it is thought that impaired satiety signaling from the saturated fat may play a role in the higher intake of food for those with the variant. [ref] [ref] Studies have also found that this variant is linked to a lower risk of heart disease. A study in the journal Nutrition took the link between saturated fat, APOA2 variant, and obesity one step further and looked into the role of saturated fat from dairy. The conclusion was that higher fat dairy did play a role in the risk of obesity with rs5082. TCF7L2 is a transcription factor gene that has been linked in many studies to type 2 diabetes risk. A study looking at the effect of a high saturated fat meal on lipid levels found that for those with the minor allele there was a significant increase in triglycerides and total cholesterol. Another study linked the variant to increased risk of metabolic syndrome in women with an even greater risk for those eating a diet higher in saturated fat. Both metabolic syndrome and high triglycerides are linked to an increased risk of heart disease in many studies. We are all different in our dietary needs. If you have the variants listed above, the American Heart Associations recommendation about cutting down on saturated fats may be worth considering. I don’t necessarily agree with their recommendation to replace the saturated fat with industrially processed canola or vegetable oils, though, and I would also challenge you to read up on the inflammatory effects of high polyunsaturated fat (especially omega-6) consumption as well. Hibiscus sabdariffa, also known as Rosella or Sour Tea, is a traditional beverage that has been shown to inhibit ACE activity and reduce blood pressure. [ref] Examine.com has a good article on the benefits and studies on hibiscus tea. Thanks for clarifying, I just got my 23&me results. However, I am confused by one part, when you mention at the end that “If you (like me!) don’t have any of the variants above”, in this part are you talking about the variants that intensify the risk like TCF7L2 Gene “TT” vs “CC or even if the person is under normal like in “cc” should avoid the saturated fat etc? I am AG: heterozygous – ACE deletion/insertion — AA: normal (wildtype) — CC: normal (wildtype)… good? Thanks for posting this! I have all of the above variants in genes and it actually makes a lot of sense. Going to change my diet to lower saturated fat intake for a while to see if it makes a difference in my weight loss. What I’ve found is that tweaking my diet to fit my genes helped a little for weight loss and helped a lot for just feeling really good. It makes sense that since multiple genes play a little role in weight gain, it is taking multiple little changes for weight loss. What I think has helped me the most for weight loss, though, is getting my circadian rhythm on track. Check out my article on circadian rhythm and weight: http://www.geneticlifehacks.com/circadian-rhythm-connections-part-2-weight-loss-and-meal-timing/ Since I started blocking blue light in the evening, sleeping in total darkness, and getting more sunlight during the day I’ve gradually lost about 15 lbs without dieting. Small note on improving reader experience: leave the rs SNP ID out of the 23andme hyperlink, such that one can quickly copy&paste the ID for raw data lookup. Thanks for the suggestion, and I’ll have to work on a way to incorporate that into the site. I do understand your frustration — I was just the other day doing some cutting and pasting the rsid’s into a huge Excel file that I keep for my own family.